David Bensadoun is the CEO of the shoe company ALDO Group which does business in 65 countries. Back when he was a kid of 12, David Bensadoun of Montreal learned to ride a dirt bike on the trails and through the woods surrounding the family cottage in northern Vermont. When he went to visit relatives in France at Christmas and New Year’s, he would often see competitors in the world-famous Dakar Rally ride, or drive, past their house. “I’m going to be in that someday,” he thought. 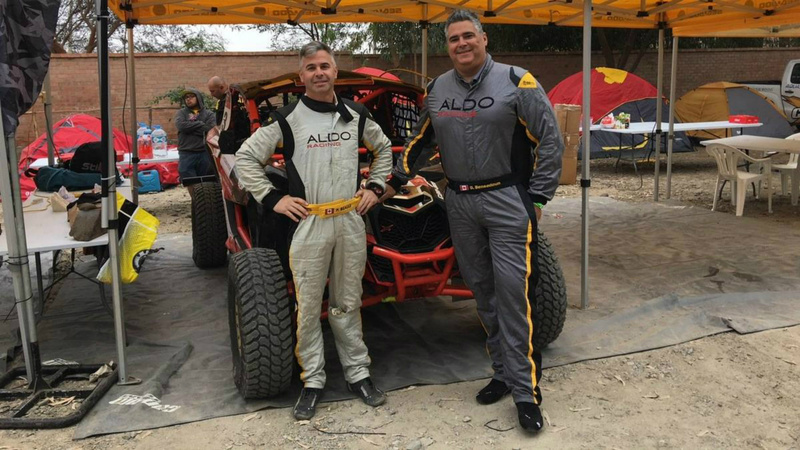 Tomorrow, in Lima, Peru, the 41st running of the Dakar will be flagged off and Bensadoun, now 48, and his Quebec co-driver, Patrick Beaulé, are entered. That’s a lot of years and a long way from a summer cottage and vacations in France. But follow along, because David Bensadoun’s route from there to here is an interesting one. His adventurous – some might even say risk-taking – nature showed itself early. Not content with trails through the Vermont woods, young David made the mistake of taking that dirt bike out on a public highway and his father hit the roof. He took away the bike and told his son that if he ever wanted to ride a motorcycle again, he’d have to buy one himself. That didn’t happen till Bensadoun was in his 20s. He’s been making up for lost time ever since. Which brings us to Peru, and the Dakar. What are his expectations? Not that many Canadians actually get to race in the Dakar. You don’t just sign up to enter what was originally called the Paris, France-to-Dakar, Senegal Rally Raid (endurance race) that has been run through South American countries since 2009 after outlaws and other terrorists made things too dangerous to continue holding it in northern Africa. Just getting there is a challenge. If you go into the car class, you have to enter a vehicle that has been specially prepared for the whacking around it will get during the rally. Then you have to get it to the rally site, plus you and your co-driver, usually a team manager, and a support vehicle (or chase truck) loaded with spare tires and other replacement parts and support staff to keep everything humming. Then, there’s a little thing called attrition. Only about half of the entries in four classes (motorcycles, four-wheel RVs, cars and trucks – and there are sub-classes within those four) ever make it to the finish of the marathon rally, which can only be described as a grueling combination of on-road, off-road (mostly) and special stage racing held over 11 days in the mountains and deserts of Peru, with one rest day in the middle. It is a race that is not for the faint of heart. Lawrence Hacking of Georgetown was the first Canadian to actually finish the Dakar and that was in Africa, on a motorcycle. Conor Malone and Glenna Chestnutt of Toronto tried, but failed, to become the first Canadian team to make it to the finish on four wheels when the rally was held in Argentina and Chile. Finally, in 2012, Bensadoun followed Hacking into the record books by doing what Malone and Chestnutt couldn’t – get to the finish in a car. He’s taken three more cracks at it since, with his best result a fifth in the amateur class (32nd overall) in 2015. This will be his fifth Dakar. “My dream is to be at the top of the amateur ranking,” he told me in a telephone interview over Christmas. “I think we can be in the first five of the amateurs but it all depends on us not getting lost, not crashing, and the car not having any breakdowns. David Bensadoun is the CEO of the shoe company ALDO Group that was founded by his father, Aldo Bensadoun, and which does business in 65 countries. Married and the father of three, he is a graduate of Queen’s University in Kingston and Cambridge in England and headed up most of ALDO’s company divisions before landing the big job. He went motorcycle riding on vacations during the years 2000 to 2006 but in 2007 he won the bronze medal at the International Six Days of Enduro (ISDE) in Brazil. He launched ALDO Racing in 2008 and ran in the Canadian Touring Car Championship (CTCC) for the next three seasons, finishing fifth in the championship in his final year. While circuit racing with the CTCC, he earned his FIA international racing licence, bought his first rally raid 4X4 prototype, the Desert Warrior 3, and entered off-road competitions and special training events to prepare for his first Dakar. 2012: Bensadoun and Beaulé finished 39th in the Dakar Rally. The team earned the Rookie of the Year Award and they became the first Canadian team to finish the rally. 2013: Bensadoun Did Not Finish (DNF) the Dakar. 2014: He acquired a four-wheel drive, double cab Toyota Tacoma pickup truck built by Hallspeed. Finished first in class and fourth overall in the NORRA 1000 Mexican Rally. DNF in the Dakar. 2015: Climbed back from 107th place on Day 3 of the Dakar to finish 32nd overall and fifth in the amateur class – his best finish to date. 2016: Finished second in the amateur class in the Silk Way Rally and 12th overall. 2017: Acquired a Century CR6 prototype designed and built by South African car manufacturer Century Racing. 2018: Finished sixth in the UTV Open Class at the Desafio Ica Rally in Peru. 2019: Will compete in the 2019 Peru Dakar Rally Jan. 6-17 in the CR6 prototype. It will be Bensadoun and Beaulé’s fourth Dakar together (Beaulé struck out on his own in 2013 and finished the Dakar 62nd overall on a motorcycle) and promises to be a true test of men and machine. The distances of each stage will vary from short stints up to between 800 and 900 kilometres a day. Bensadoun says it`s the sense of adventure and freedom that`s the attraction of long-distance racing for him. He said he went racing in the CTCC not necessarily for the competition but to get his international racing licence that would enable him to go do the Dakar and other long-distance rallies. Bensadoun was once asked to articulate the difference between the two forms of racing. “Touring car racing was a good experience for understanding the concentration needed and for having good car control,” he told Dominique Bondar, wife of CTCC founder and president John Bondar. “But, of course, 30-minute (sprint) races seem very short compared to eight-hour special stages. “Fifty degrees in the cockpit, 14 days of racing from 7 a.m. to 10 p.m. in the car every day, drinking 10 to 15 litres of water a day and never having to go to the bathroom! Hot and dusty at night, so (you get) very little sleep. Emphasizing that it`s the adventure as much as the motorsport, Bensadoun said he was disappointed when the Dakar left Africa for South America when it became too dangerous to travel through some of the countries. Asked if there were places in the world that are safe enough for a bunch of car racers to be turned loose without close supervision and protection, he said there are any number. “South America is really safe,“ he said, “as safe as Canada. And there are parts of southern Africa – Namibia, Botswana, South Africa – where it`s very safe to go racing. I’d say Libya is a no go, Egypt is no go but Morocco is really safe so I think there are options for the Dakar to move. I reminisced for a moment about the Shell 4000 cross-Canada rallies of the early 1960s and wondered whether Canada could host something like the Dakar but Bensadoun was quick to shoot down that idea. It might very well have been because he was chagrined. He once told Dominique Bondar that “early in my (CTCC) racing career, I decided I needed to be more aggressive if I was going to improve my results. This strategy resulted in some trading of paint and some excursions of the grassy kind! It’s a strategy that has worked well for him in the marathon races to date. ALDO Racing is supported by a number of Canadian companies – F.F. Walters, Stingray, SAJO, Vitesse Transport Corp and the OEC Group, among them – and is involved in raising money to fight AIDS. Since the mid-1980s, a quarter of a million dollars has been raised for AIDS awareness and research. The ALDO Group is also involved in a variety of other causes including support for hospital and programs for youth. The 41st Dakar Rally will be 5,603 kilometres in length and will feature 2,061 kms of timed special stages of which 70 per cent will be run in the desert sand and broken dunes of southern Peru. The start and finish lines will both be located in the capital city of Lima. Tomorrow, there will be a ceremonial start – and tens of thousands will be out to get autographs and to cheer on the entrants — with the real-time action beginning the next day with a short, 84-km, special stage. Then it will be flat-out to the finish a week from Thursday, except for the rest day in Arequipa next Saturday.